I wondered if you could send me a screen shot of the page that you write in, so I can see what the labels are on the columns ? The images don't show up the coloumn labels very clearly. So here's a list of them: 1. Quantity received from supplier 2. Date supply received 3. Name and address of supplier 4. Balance in stock 5. Date 6. Patient's name or name and address of healthcare professional collecting 7. Proof of identity if required 8. Amount given 9. Dispensed or disposed by 10. Witnessed by 11. Balance left in stock Hope this helps! For the safety and security of all your patients, our Controlled Drug Record Book allows those working in the medical or patient care fields to accurately record the administration of controlled drugs. Suitable for use in environments where carers change with shift patterns or where multiple patients are seen in any given time frame, this informative book allows each administrator to make a note of all essential information from the quantity administered, the date of receipt of the drug from the supplier and the time given to avoid the risk of double-dosage at any point. An essential tool for all those working in the medical industry to ensure the optimal and controlled care of each of their patients. 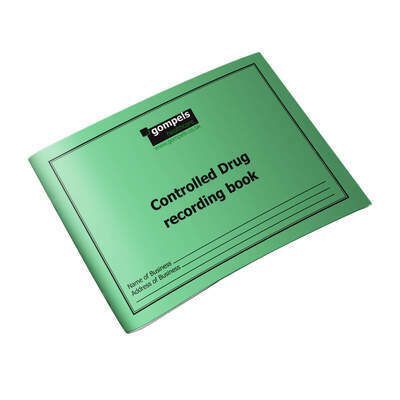 Alongside our Controlled Drug Book, Gompels also stock a range of other Record Books, each suitable for keeping track of essential information in a busy work environment.